Scientists believe that the moon was formed when a Mars sized planet called Theia (in Greek mythology the mother of the moon Selene) collided with the Earth 4.5 billion years ago. The resulting debris from the impact coalesced and formed the moon. This hypothesis is called the Great Impact Theory. 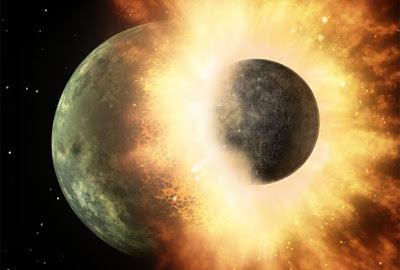 Prior to the Great Impact Theory, the predominant explanation theorized by George Darwin in 1898 for the formation of the moon was that the moon spun off from the Earth because of centrifugal forces (known as the Fission Theory). In 1946, this was challenged by Canadian geologist Reginald Daly of Harvard. He proposed that it wasn't centrifugal force but an impact that formed the moon. In 1974, Daly's proposal was once again brought up and discussed during a conference on satellites. Dr. William K. Harmann and Dr. Donald R. Davis suggested the Great Impact Theory. They brought up that this theory could explain the moon's geological and geochemical properties. Washington University in St. Louis planetary scientist Frédéric Moynier says his group has discovered evidence of the Great Impact Theory. Using moon rocks collected 40 years ago from the Apollo missions, the team detected an excess of a heavier variant of zinc in the rocks. They theorized that this variant of zinc condensed out of the cloud of vaporized rocks formed from the collision. Lighter zinc atoms would have escaped before it could condense. This detection of the difference in the element is called isotopic fractionation. Something that has evaded proponents of the Great Impact Theory. Isotopes are variants of an element that have slightly different masses. Isotopic fractionation is the process of determining between the actual amount of fractions of the isotopic elements collected and the desired purity in each fraction. Moynier, PhD, assistant professor of Earth and Planetary Sciences in Arts & Sciences — together with PhD student, Randal Paniello, and colleague James Day of the Scripps Institution of Oceanography — are the first to find it. It was noted that the moon rocks where chemically similar to the rocks found on Earth except for the fact that easily evaporated elements called volatiles were not present in the moon rocks. Because the depletion of volatiles would corroborate the impact theory, it should also have produced isotopic fractionation. Before this discovery, Scientists could not find this isotopic fractionation for more than 30 years. Using a mass spectrometer, an advanced instrument that precisely measures the ratios of isotopes of a particular chemical element, which Day said revealed information not accessible even five years ago, they discovered the fractionation. "The magnitude of the fractionation we measured in lunar rocks is 10 times larger than what we see in terrestrial and martian rocks," Moynier says, "so it's an important difference." The data, published in the Oct. 18, 2012 issue of Nature, provide the first physical evidence for wholesale vaporization event since the discovery of volatile depletion in Moon rocks, Moynier says.